Magaluf, Maga, whatever you call it, this is one resort that knows how to party! And if you’re wondering where in Europe to have your clubbing holiday this summer, we’ve got 5 reasons that might just convince you to make it Maga! Magaluf’s favourite daytime venue, Ocean’s Beach Club has been a staple destination for all Magaluf partygoers! Live the VIP lifestyle for a day whilst you sit by the poolside with a cocktail in hand and the perfect view of the beautiful blue Mediterranean ocean! Can life get any better than this? 2. Bars upon Bars upon Bars! 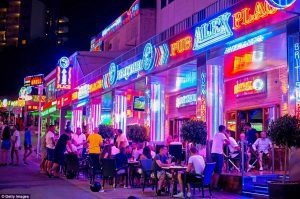 Magaluf sure knows how to do nightlife and on the Punta Ballena strip, AKA The Strip, you’ll be spoilt for choice with over 80 neon lit bars and everything from house and hip hop to RnB, and Drum & Bass. You’ll definitely find a bar playing your kind of music on your Magaluf party holiday. Chances are, when it comes to mealtimes on your party holiday with your mates, you want a) food that isn’t going to cost a fortune and b) something that tastes good. 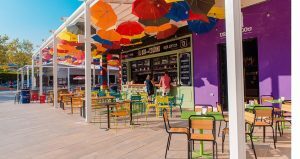 No need to worry in Magaluf as there’s everything from McDonald’s and Pizza Hut for that taste of home to Spanish restaurants and themed bars. And best of all, it’s really cheap too. 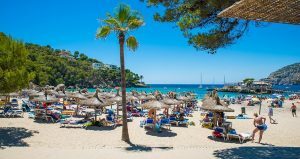 Everyone needs some chill time, even on a party holiday and there’s no better place to kick back than on Magaluf’s gorgeous beaches. Expect golden sand, loads of loungers and bars and restaurants just a few flip-flops away! There’s no better time to get booking your 2019 lads’ and girls’ party holiday to Magaluf! It’s where Megan McKenna, Vicky Pattison, Mark Wright and the Love Island peeps hang out- BH Mallorca- Magaluf’s most exciting new hotel with the world’s first adult water park featuring white knuckle slides, wave pool and giant Jacuzzis! 2018 saw pool parties hosted by Kiss FM and for 2019 you get a bonus BH Pool Party pass worth £150 for free with your Essentials Events Package. 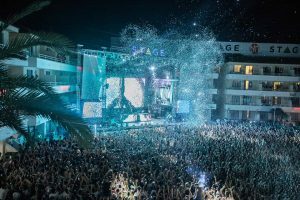 Just book your 2019 clubbing holiday to Magaluf with us, and it’ll be you partying with the celebs in Maga this summer!